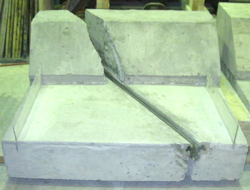 Bridge expansion joints, if not properly designed, constructed, and maintained, often lead to the deterioration of critical substructure elements. 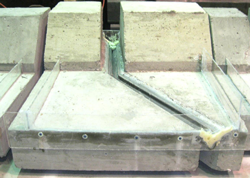 Strip seal expansion joints consisting of a steel extrusion and neoprene gland are one type of expansion joint and are commonly used by the Iowa Department of Transportation (DOT). Strip seal expansion joints are susceptible to tears and pull outs that allow water, chlorides, and debris to infiltrate the joint, and subsequently the bearings below. 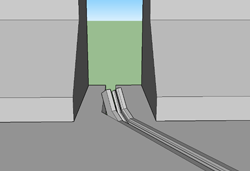 One area of the strip seal that is particularly problematic is where it terminates at the interface between the deck and the barrier rail. 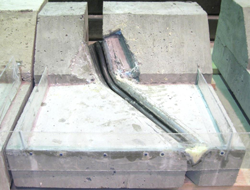 The Iowa DOT has noted that the initial construction quality of the current strip seal termination detail is not satisfactory, nor ideal, and a need exists for re-evaluation and possibly re-design of this detail. Desirable qualities of a strip seal termination detail provide a seal that is simple and fast to construct, facilitate quick gland removal and installation, and provide a reliable, durable barrier to prevent chloride-contaminated water from reaching the substructure. To meet the objectives of this research project, several strip seal termination details were evaluated in the laboratory. Alternate termination details may not only function better than the current Iowa DOT standard, but are also less complicated to construct, facilitating better quality control. However, uncertainties still exist regarding the long-term effects of using straight-through details, with or without the dogleg, that could not be answered in the laboratory in the short time frame of the research project.